(A 15 second commercial appears before this segment begins). Here’s a clip from a household cleaning expert on AOL News. 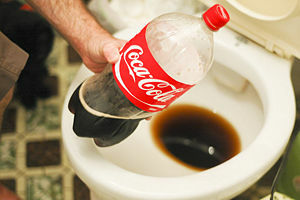 He recommends using Coca Cola to clean toilets. If Coca Cola is that effective cleaning the bowl, then is it safe to drink? Wholistic health advocate, Dr. Joseph Mercola doesn’t recommend drinking soda pop because it contains high amounts of sugar, calories, harmful additives, and has no nutritional value. According to U.S. News, a recent study by Harvard University concluded that every year, there are 180,000 preventable deaths worldwide due to the consumption of soda and other sugar-sweetened drinks. Thinking of replacing regular soda pop with a diet drink? You’d better read the label to find out what type of artificial sweetener is in your drink. Aspartame is a chemical sweetener found in soda pop. It’s sold under the brand name Equal, and NutraSweet. According to Dr. Mercola, there are over 92 different health side effects associated with ingesting aspartame. Read more about The Real Dangers of Soda To You And Your Children on his website. Soda consumption is associated with pancreatic cancer, diabetes, and heart disease. Posted on April 20, 2013, in Chronic Disease and tagged Coca Cola, diet coke, empty calories, Joseph Mercola, NutraSweet, sugar substitute. Bookmark the permalink. Leave a comment.